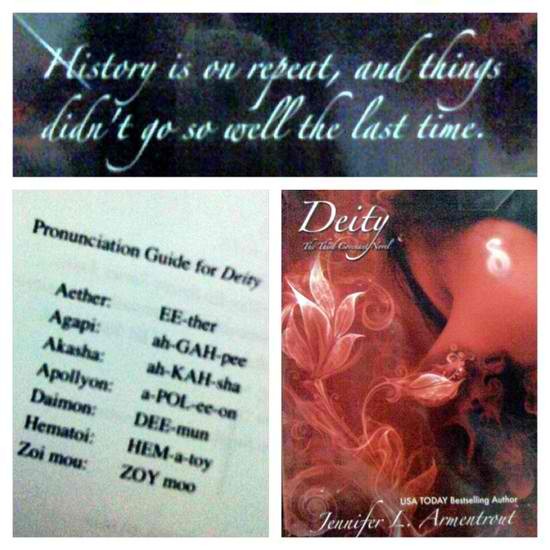 So, apparently I need to breathe for a little while before I start writing my review on Deity by Jennifer L. Armentrout. So yeah, breathe in. Breathe out. It's official I am now hooked and I am now a certified Jennifer L. Armentrout fan. And I am now irrevocably in love with Aiden St. Delphi. *Fans self but still ends up swooning* Omigods! I have to say that these books just keep getting better and better. First of all, I really, really, really wanted to give Alex a hug during the first half of the novel. I mean seriously, being ostracized and everything even if it was partly her fault was just awful. I just felt like for a teenage girl to go through everything that she's been through is just terrible. I felt her sadness whenever she broke down and everything. And then, one revelation after the another comes popping up from somewhere. Honestly, I just felt so proud of Alex for staying intact mentally. I'm just so proud of her. I think she grew up in some ways even if she was still the same girl who acted on impulse most of the time. I just didn't know what to make out of everything that's been going on. And I'm just so proud of Alex for keeping up with everything even if I did get pissed at some point in the story because I felt like she just couldn't make up her mind with her love life. Oh well, she did manage to choose so: "Yey for her!" Then of course, there is my oh so yummy Pure Sentinel, Aiden St. Delphi. Omigods! He just upped his game on this one. I am irrevocably in love with him right now. Breathe in. Breathe out. I just love the guy. His protectiveness when it comes to Alex just turned me into mush. All of the scenes between him and Alex just made me want to take a cold shower. Ha! There I've said it! Seriously, everything just made me feel like goo. I just love, love , love Aiden. I also think the scenes between him and Deacon were just hilarious and heartwarming at the same time. The revelation regarding Deacon did surprise me quite a bit. Anyway, I just fell in love with Aiden more in this installment. His devotion to Alex just knows no bounds. Lastly, there's Seth, the First Apollyon. For some reason, Seth just ticked me off. I know I'm supposed to pity him since Alex was just "settling" for him, as Aiden liked to point out time and time again but he just ticked me off. I wanted to kick him between the legs or something. He was a manipulative jerk and I seriously don't like him at this point. I don't know. I just feel like he was just too unstable and self centered that I found it a bit difficult to read his parts even though I was captivated by the entire book. Overall, I pretty much enjoyed this book a lot. Probably more than the first two. There were a lot of revelations in this installment that might just spice up the story more if possible. I honestly didn't want this book to end. I kept on prolonging my reading but I just couldn't help but pick it up again and again. The novel was just so captivating and beautifully written that I just couldn't help but pick it up again and again. I loved the appearance of some of the gods as well. The identity of one god didn't really surprise me since I've had my suspicions from the very start but that didn't stop me from squealing when it was revealed. Anyway, the book just kept me hooked and I wasn't really able to do much this Saturday since I just kept on reading. I love this book and I can't wait to get my paperback of Apollyon (Covenant#4) once it's out. Good thing my mom pre-ordered it for me already. I so love my mom. I'm still reeling until now so I am really sorry if you feel like I'm just rambling here. This book is just that AWESOME! It made me laugh, cry, cuss and everything else that I could possibly do at the moment. Aiden being the yummy Sentinel that he is didn't exactly help with my coherence or rather incoherence at the moment. Rating: An easy 5/5 stars!